A place to discuss automated build tools. What is the purpose of build software like Jenkins? copy a file to a directory that can change part of name with ANT? 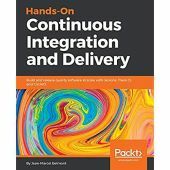 What free online continuous integration services do you use? Is CI/CD approaches or the best practices will differ an app which is on-premise to Cloud based? Debugger does not go to the changed code unless I do maven install. How to solve Profile id _SELF_ is not registered?